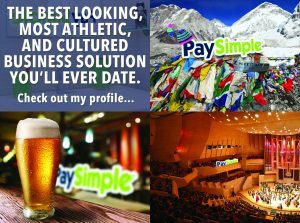 Small Business Owners – Take PaySimple on a Date! When’s the last time you went on a date with a business service provider that said its number one priority was to make you love your business so you can live your life? That would be a match made in heaven, wouldn’t it? This Valentine’s Day, we invite you to see if PaySimple is a match – if we have that special something that makes you giddy and excited to see us again. And to make it easy, we filled out a little online dating profile so you can see what we’re all about. All of our photos are current. And yes – being organized really is that important to us. So maybe you’ll like our swagger and we can take you out on a date sometime soon? We’re a whole lot of fun – but more importantly, we’re passionate about what we do, and we both look good doing it..
Sue is the Chief Growth Officer for PaySimple, the leading platform for managing and growing small businesses. In her spare time, she's a golfer, mentor of 20-somethings, cyclist, hiker, and appreciator of most things out of doors.